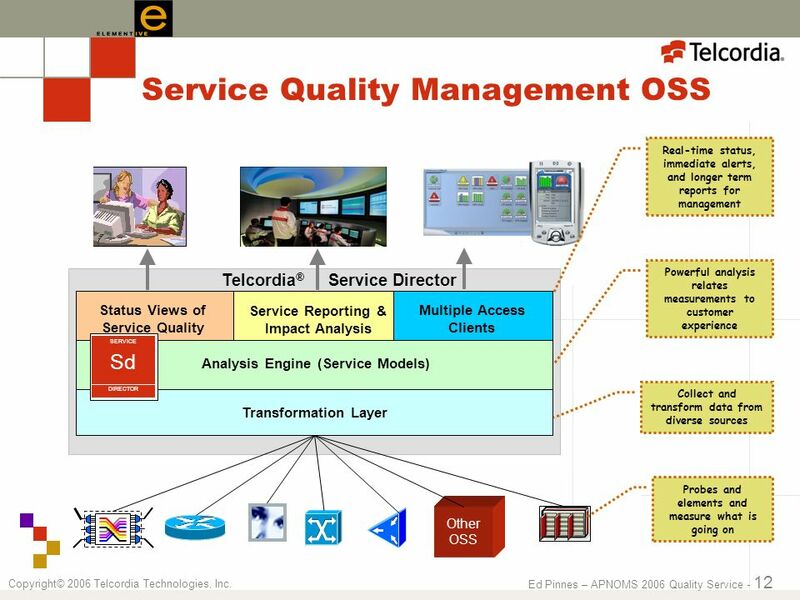 Copyright© 2006 Telcordia Technologies, Inc. Are You Delivering Quality Service? APNOMS 2006 Busan, Korea September 27-29, 2006 Dr. Ed Pinnes Telcordia. 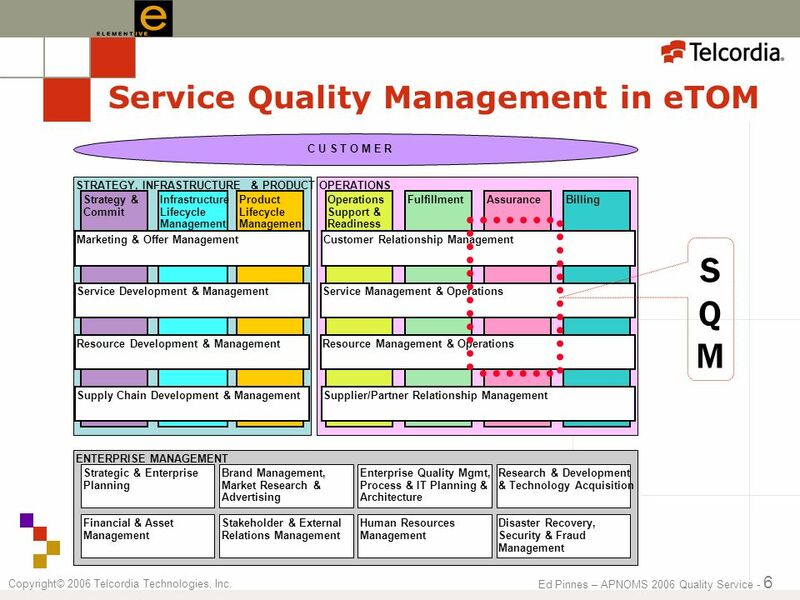 2 Ed Pinnes – APNOMS 2006 Quality Service - 2 Copyright© 2006 Telcordia Technologies, Inc. 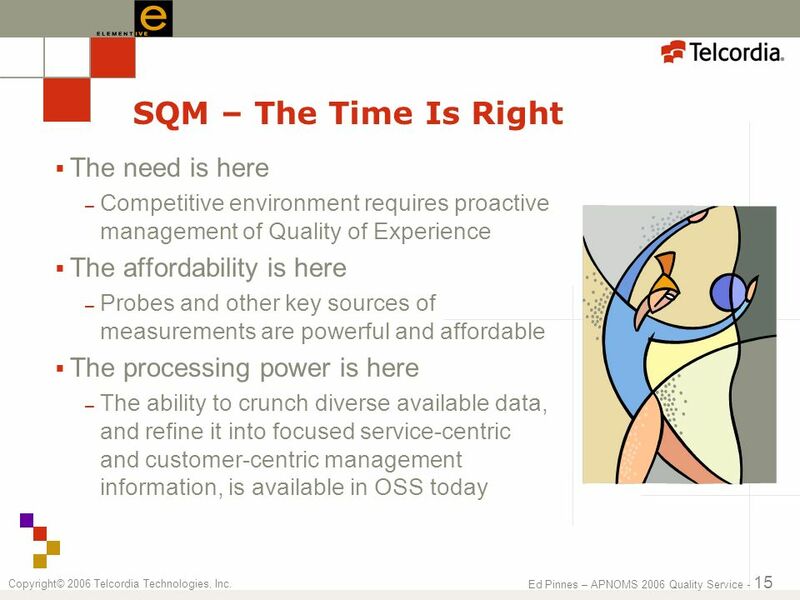 Agenda The Opportunity of Convergence The Role of Service Quality Management (SQM) Measuring and Managing Quality for IP-Based Services The Time is Right Are You Delivering Quality Service? 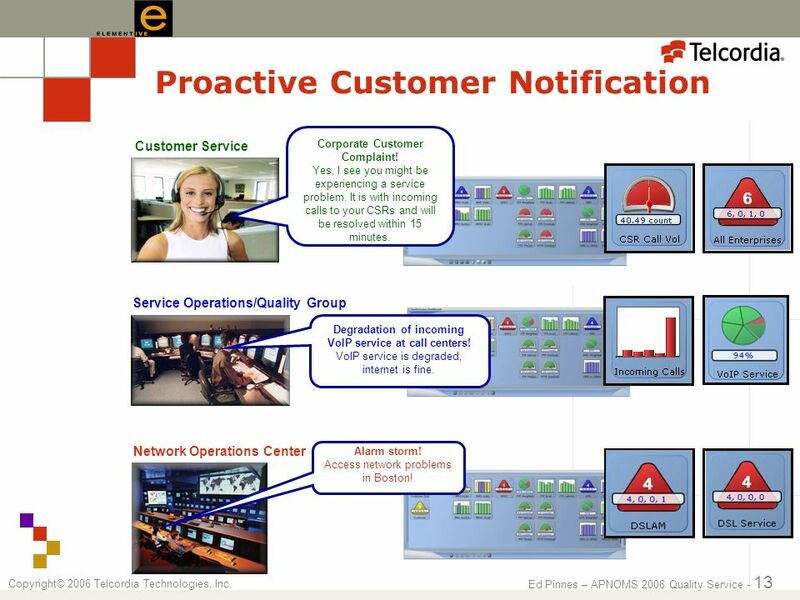 13 Ed Pinnes – APNOMS 2006 Quality Service - 13 Copyright© 2006 Telcordia Technologies, Inc. Proactive Customer Notification Customer Service Service Operations/Quality Group Network Operations Center Alarm storm! Access network problems in Boston! 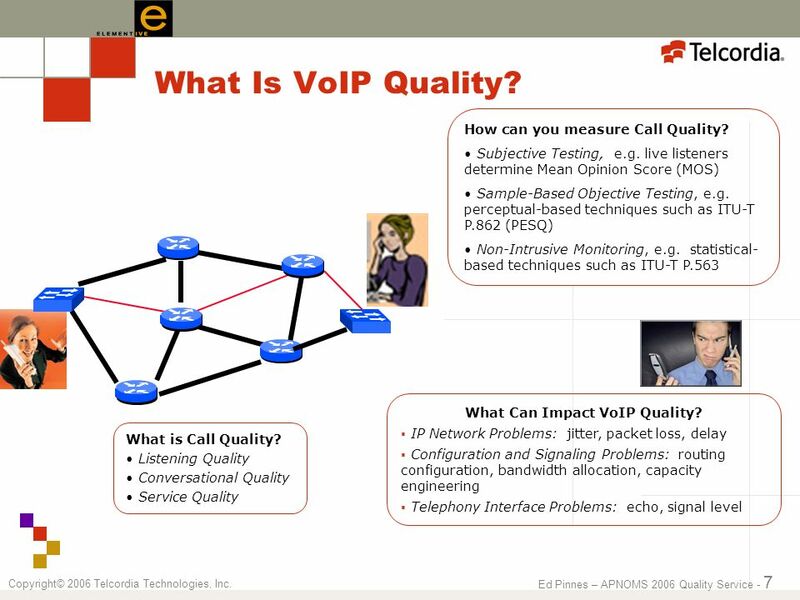 Degradation of incoming VoIP service at call centers! VoIP service is degraded, internet is fine. Corporate Customer Complaint! Yes, I see you might be experiencing a service problem. It is with incoming calls to your CSRs and will be resolved within 15 minutes. 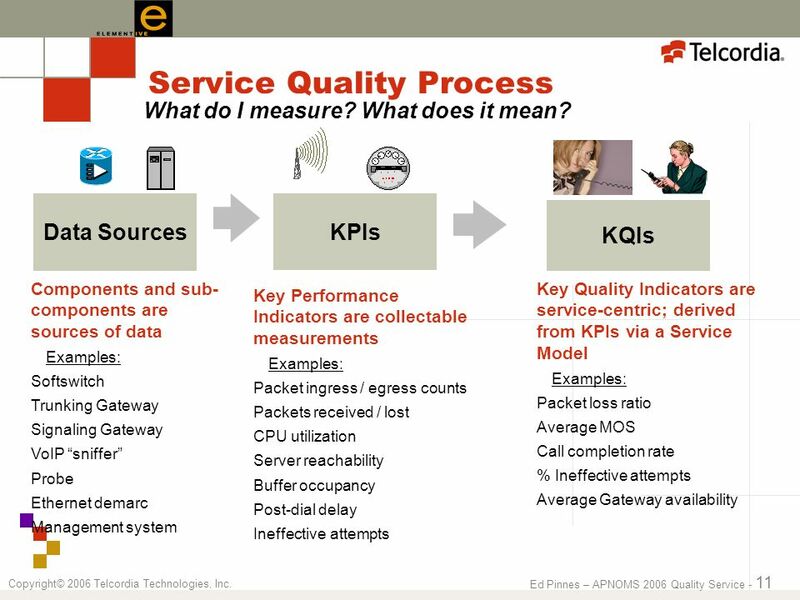 14 Ed Pinnes – APNOMS 2006 Quality Service - 14 Copyright© 2006 Telcordia Technologies, Inc. 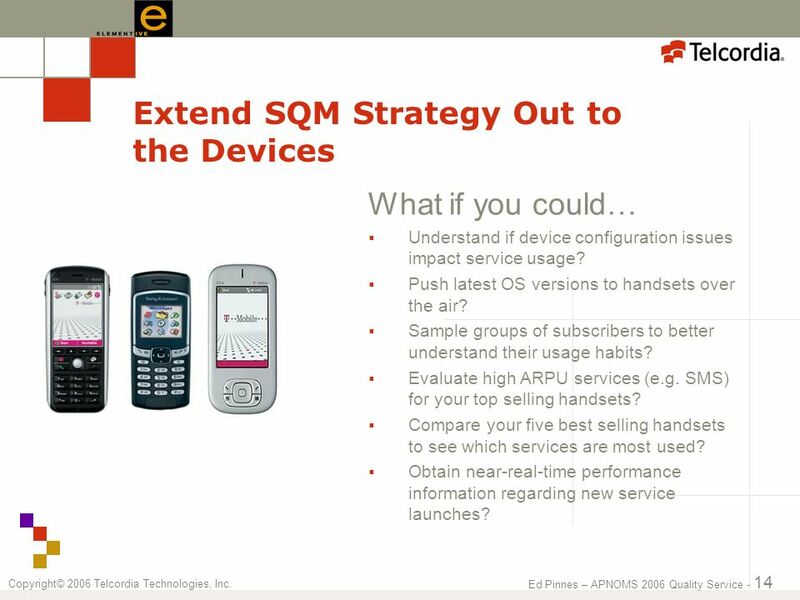 Extend SQM Strategy Out to the Devices What if you could… Understand if device configuration issues impact service usage? Push latest OS versions to handsets over the air? Sample groups of subscribers to better understand their usage habits? 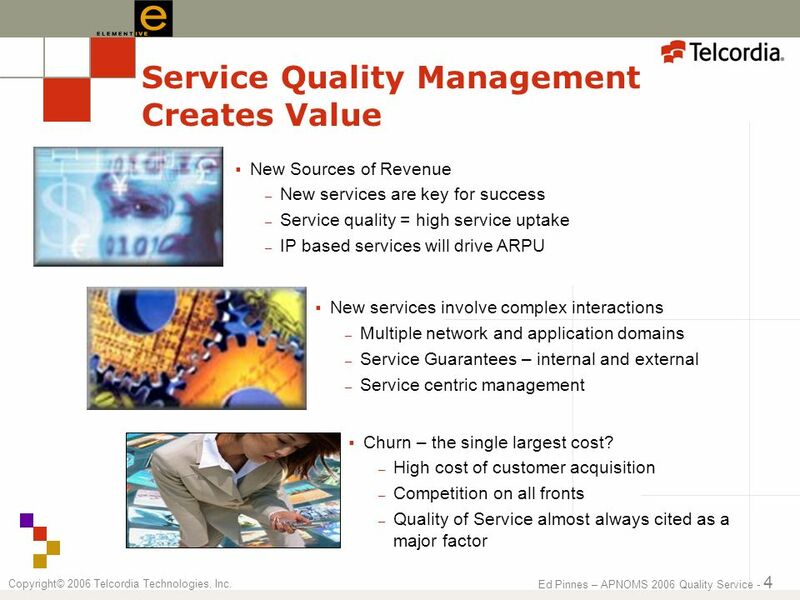 Evaluate high ARPU services (e.g. SMS) for your top selling handsets? Compare your five best selling handsets to see which services are most used? 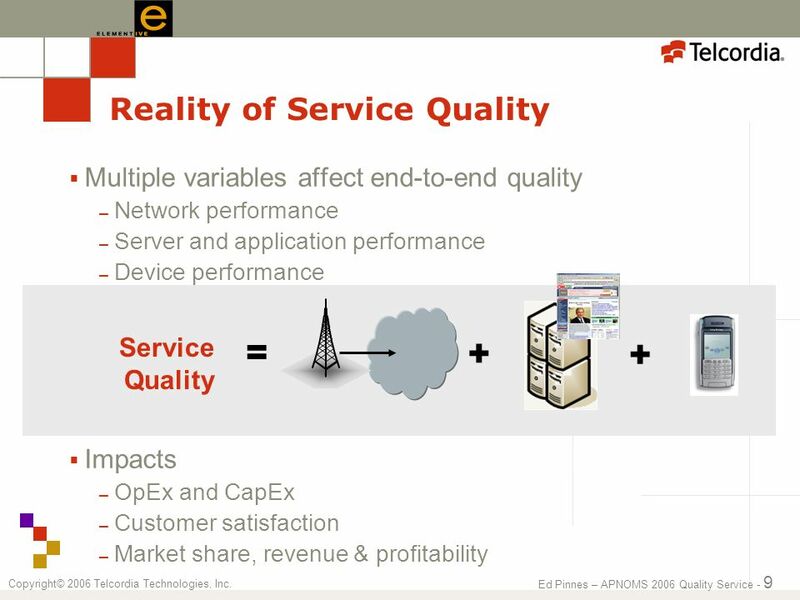 Obtain near-real-time performance information regarding new service launches? 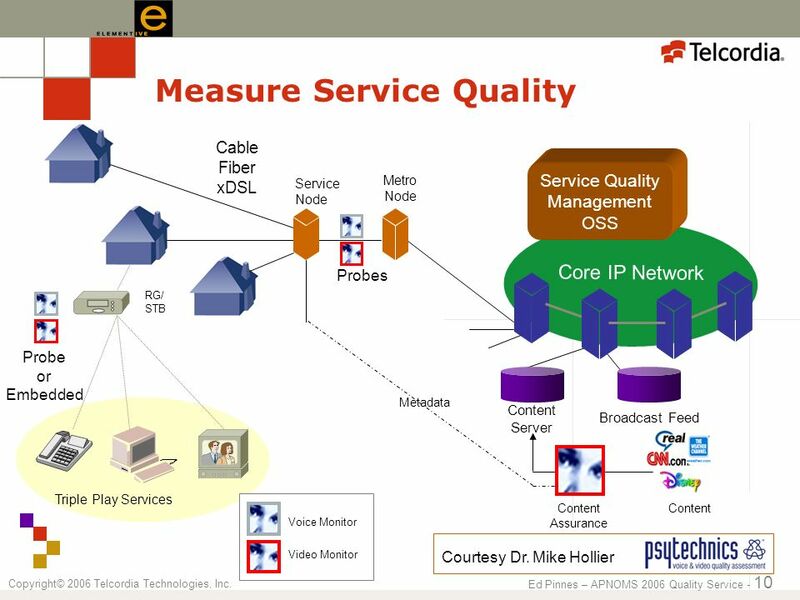 16 Ed Pinnes – APNOMS 2006 Quality Service - 16 Copyright© 2006 Telcordia Technologies, Inc. 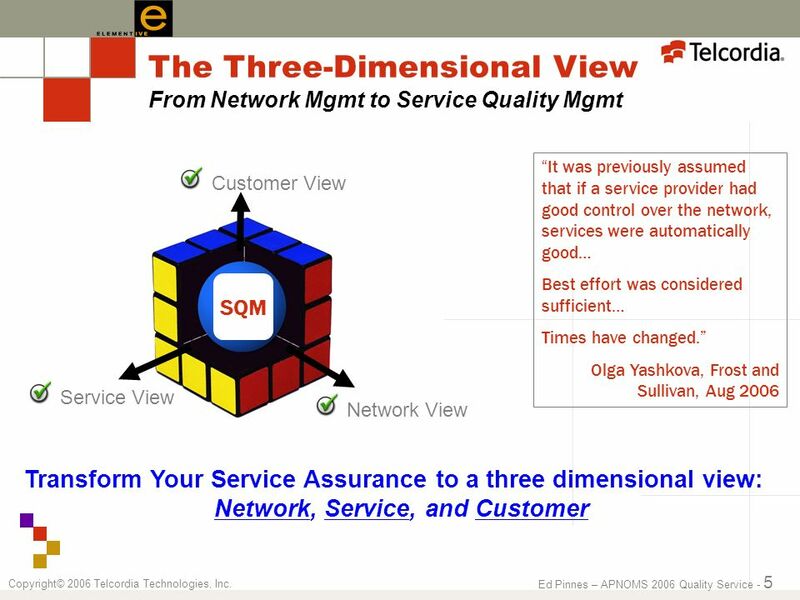 Understand the end customers Quality of Experience Measure and manage the quality you provide to your end users Know the overall health of your network Proactively solve impending problems Find and fix problem spots Relate measurable quantities to service- centric criteria via service models Gain an edge in the competitive marketplace What Can SQM Do For Your Business? 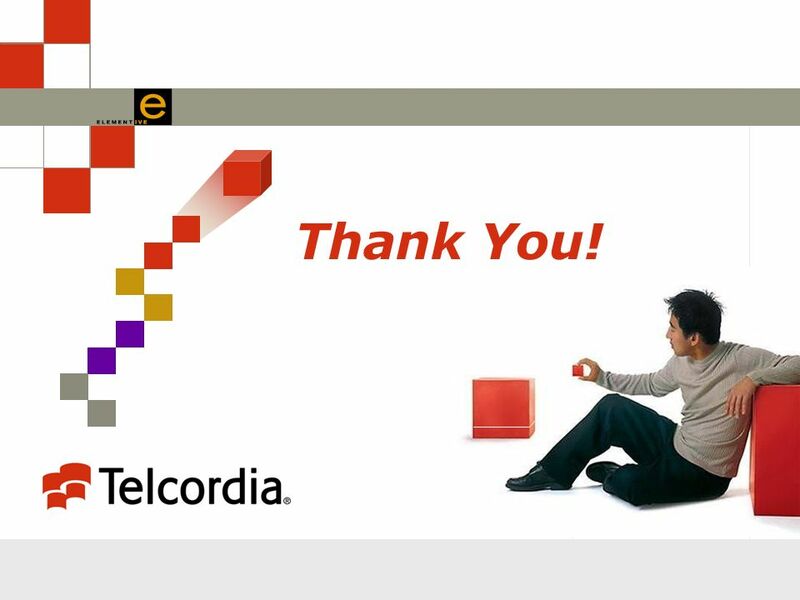 17 Copyright© 2006 Telcordia Technologies, Inc. Thank You! 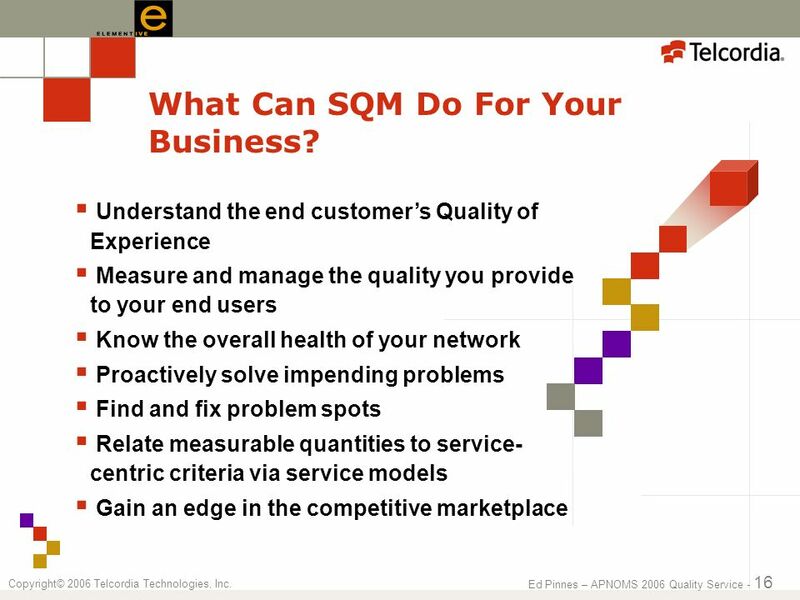 Download ppt "Copyright© 2006 Telcordia Technologies, Inc. Are You Delivering Quality Service? 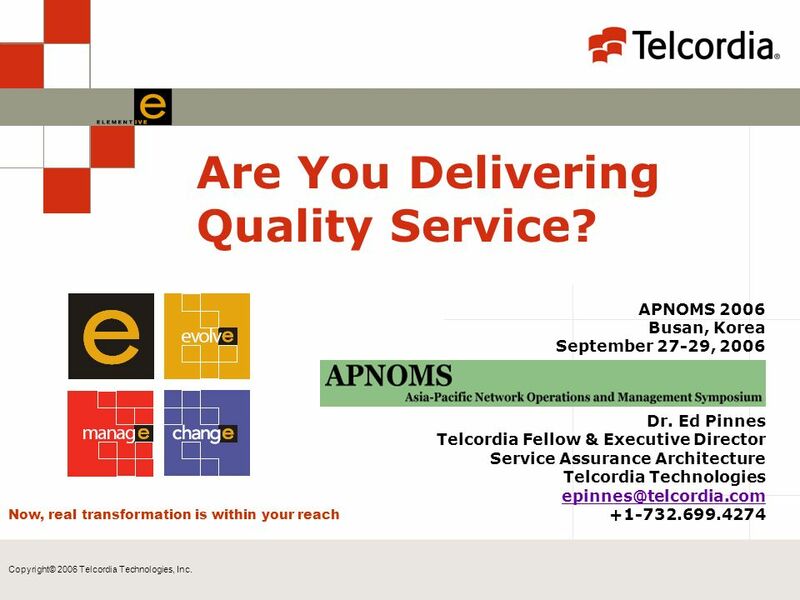 APNOMS 2006 Busan, Korea September 27-29, 2006 Dr. Ed Pinnes Telcordia." IMS and Security Sri Ramachandran NexTone. 2 CONFIDENTIAL © 2006, NexTone Communications. All rights Traditional approaches to Security - The CIA principle. 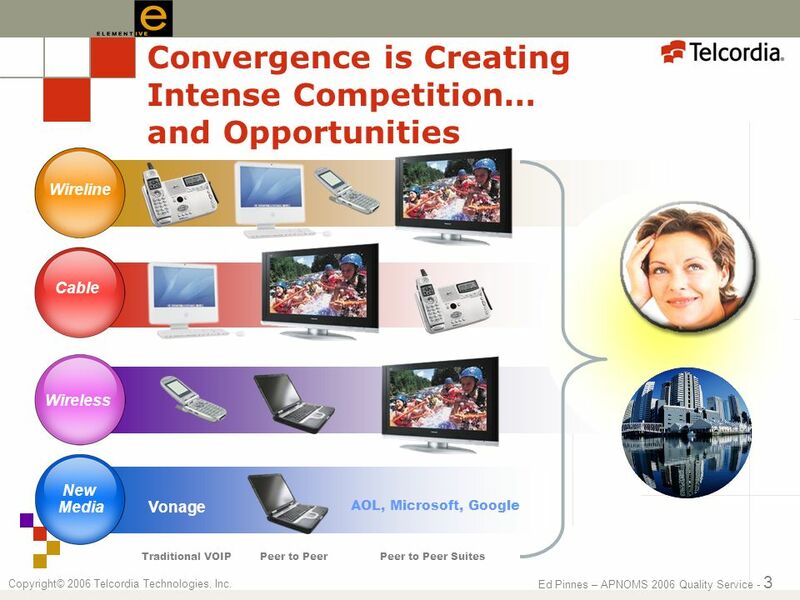 1 Welcome Overview of DOCSIS. 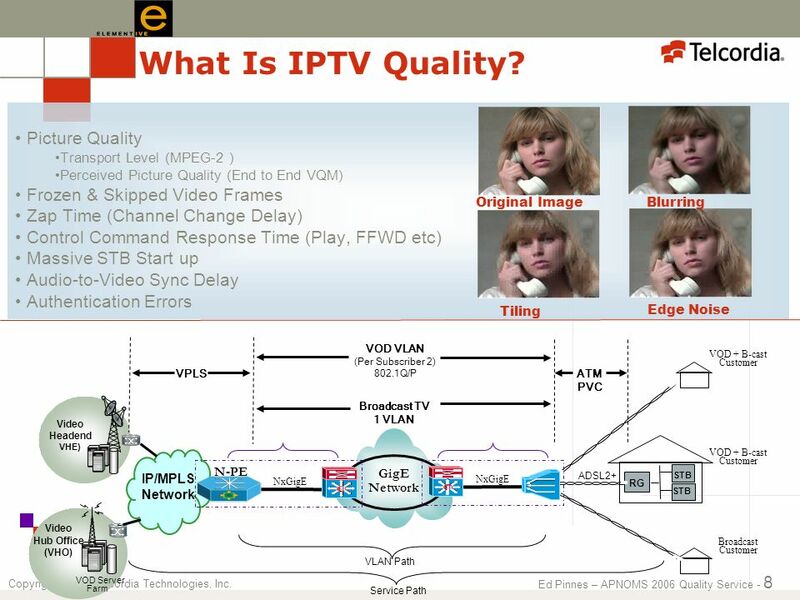 2 Data Over Cable Service Interface Specification. IPTV Technology Team 3 – Christopher Monclova, Rafael Leefoon, Nick Adasi, Robb Zucker & Oscar Ucedo.